So, I went home on the weekend for two things. I had to attend a wedding on Saturday evening and Sunday was Mother’s Day. The wedding was actually a lot of fun. I have been to two weddings that were just cocktails. They were both really good. So good, in fact, that I have decided that I will only attend weddings that have cocktail receptions. There is no way I want to do the whole dinner thing ever again. And I mean it. While at home I spent some quality time with Oscar the cat, or Gatto Mas Gordo, which is his Spanish name. He has a vet appointment coming up. Good thing because I was amazed at his girth. 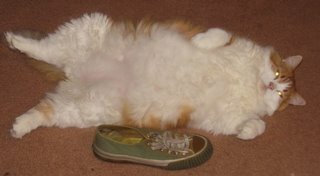 So, I am starting off the “Guess Oscar’s Weight” contest here on the blog. Here are a couple hints: 1. the shoe beside Oscar is a size 10 ladies PF Flyer. 2. He is NOT all hair. When you pick him up, you realize he is all body. So, let the guessing begin. When GRC takes Oscar to the vet and if they can get him on a scale she will report back with his weight. Let the guessing begin!